Not easy to be surprised these days, with so many yachts being the subject of press releases at the moment. But it's not the case this time, with the first picture of the latest yacht built by JFA, a maxi catamaran currently known under the project name VPLP 110. Spotted a few days ago when she came back from sea trials, here is a preview of the new catamaran built by JFA in Concarneau, France. Her project name gives us more details about her pedigree. 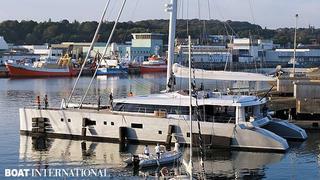 She's designed by Van Peteghem & Lauriot Prévost (VPLP), and her length is 33.5m (110) with a beam of 14.05m. These dimensions make her the largest catamaran built in carbon epoxy. Few details are known for the moment about the interior. Designed by Cittolin Polli, it accommodates eight guests and a crew of six. Her air draft being 45.5m, this catamaran will have a sailing area of 765msq, and in case of light winds she'll be powered by twin 355hp Cummins engines. Note that all these details come from the new website of JFA, with the yard refusing any comments for the moment because of a confidentiality agreement. We hope to give you more details in the near future. The VPLP 110 catamaran will be delivered this autumn.